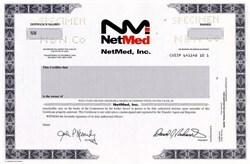 Beautiful engraved specimen certificate from the NetMed, Inc . This historic document was printed by Northern Bank Note Company and has an ornate border around it with a vignette of the company name. This item has the printed signatures of the Company's President, David J. Richards and Secretary. 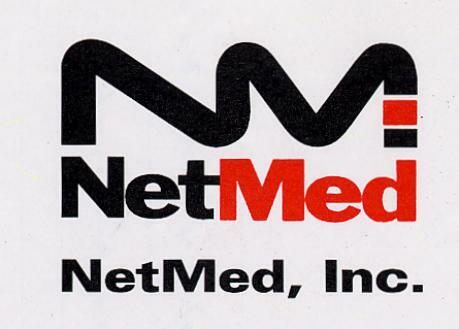 NetMed, Inc. was engaged in the business of acquiring, developing and marketing medical and health-related technologies, including the PAPNET test, which it marketed in territories under exclusive license, and the OxyNet(R) oxygen concentration device which the company was developing for the home healthcare market.